Bread is one of my favorite things to make, so I am always looking for new bread recipes. Homemade bread tastes so much better than store bought bread. Not only does it taste better, but it is usually cheaper to make my own bread. When I saw this recipe in a cookbook my sister gave me a few years ago, I knew I wanted to try it. The fact that it is a quick biscuit type bread appealed to me. I like the fact that it was a no knead easy bread to make. This goes really well with a bowl of soup or chili, but I also serve it with meatloaf or roast. The leftovers are really good toasted and buttered. If you have never baked homemade bread this is a good place to start. Give it a try you will love it. Heat oven to 350. Generously grease a 9×5 loaf pan with oil. In a bowl whisk together flour, baking powder, salt, cayenne pepper, and black pepper. Carefully stir in cheese cubes until cheese is well coated. In a separate bowl whisk together the remaining ingredients. Fold the milk mixture into the flour/cheese mixture. Stir just until combined, do not over stir. The mixture will be thick. Pour/spread into greased loaf pan. Bake for 45-50 minutes. Let cool 10 minutes and then remove from pan. Let cool one hour before slicing and serving. This recipe adapted from America’s Test Kitchen Family Cookbook. Wow. This looks fantastic! I love the vibrancy of the cheese! 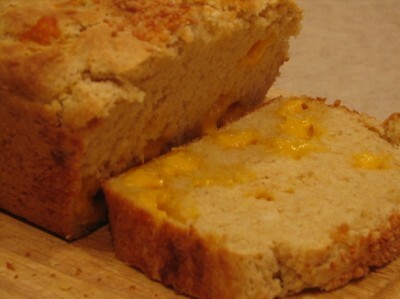 I enjoy making quick breads like this and since cheddar cheese is one of my favorite cheeses I’m sure I’d enjoy this bread! Thanks! Cheese and bread – two favorite foods. Looks like a winner to me, especially since it’s a quick bread! This sounds like the perfect accompaniment with a big bowl of chili on a cold night! Come visit and join my first giveaway today! Oh my! That looks so good. I have been craving cheese biscuits lately but I’m thinking this may just be the ticket!! Thanks for sharing. Ok, I am excited now because I see there is no kneading or yeast involved. THIS I can do. And it looks awesome. Making it!!! I really love your recipe for cheese bread. The loaf you made looks spectacular. I can’t wait to give this a try. Do you use REAL butter is all baking recipes, breads, mufffins, etc.? Salted or unsalted? Thanks! Cara, yes I use real butter in my recipes. I have not used anything else in yrs. Unsalted is best for baking, but I do use salted if I have it, but I then cut back the salt some in the recipe. That bread looks so delicious. I am a cheese-aholic and I would probably eat the entire loaf in a matter of hours. YUM! One more question: Do you have a recommendation on a type or brand of loaf pan? I seem to have trouble with breads being undercooked in the middle but overdone on the outside! Possibly because I am using the wrong type of pan? Thank you for the awesome website! I cannot wait to start trying your recipes! O.k. Last question, can I just buy whole wheat flour at the grocery store or do I need to buy a specialty kind? Cara, have several different kinds of loaf pans. My favorite is probably stoneware. I have both glazed and an unglazed pamperedchef one. One trick though to get the bread done without being overdone on the outside is to place a piece of foil on the top of it for the last 10 minute or so. This usually helps the crust not get overdone. On whole wheat I actually have been grinding my own, but I know that is not an option for everyone. When I bought it I preferred a nicer stone ground whole wheat. Love your recipe for cheese bread. I am saving this one. I make bread all the time, but I’ve never made a non-yeast cheese bread. I can’t wait to try it. Great looking bread. I love cheese bread. I’m going to try this recipe, maybe had some chopped jalapenos, too! This looks so good and easy –definetly going to try this soon. This looks so good I had to make it. I can’t wait for it to come out of the oven! this sounds so good -maybe with some chili. Hi! I love your blog, and have used so many recipes from here! You’ve saved my life a few times :-)! I was wondering, would it be okay to use shredded cheese instead of cubes…would it make a huge difference? Thanks for the help!! @Sumi, Yes you can use shredded cheese. We liked the chunks of melted cheese, but shredded also works fine. I hope you enjoy it! @Sumi, And I am glad you like my recipes. Thank you for reading! Excellent and filling recipe. Great just by itself for lunch. Mmmm! TY Lynn! I made this along with your porcupine meatballs for dinner tonight and they were both fabulous!!! I love that the bread has cayenne pepper in it!! I am so glad you enjoyed both of them. Thanks for letting me know.